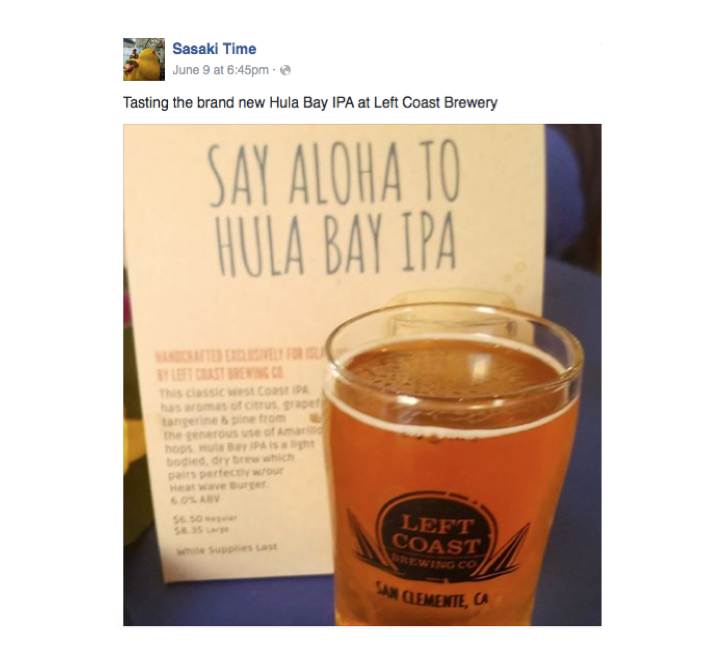 Hula Bay IPA: Crafting a newsworthy partnership with Islands and Left Coast Brewing Co. This might come as a surprise, but craft beer is kind of a big deal in San Diego. So, when we got the news that our client, Islands Restaurants, was teaming up with San Clemente-based Left Coast Brewing Co. for an exclusive summer brew, we knew it would be a unique…hoppertunity (sorry, it was too easy!). Enter the Hula Bay IPA: a classic West Coast IPA with hints of citrus, grapefruit, tangerine and pine. Fruity, tropical and totally on-brand for the laid back, surf-inspired restaurant. After the team had a few taste tests (in the name of research, of course), our media friends were ready to say aloha the Hula Bay, and what better way than to introduce them to the brewers themselves? We gave the Left Coast tasting room a tropical makeover – think: surfboards, surf-inspired artwork, pineapple centerpieces – and invited a group of media and bloggers to be among the first to taste the new beer and sample food from Islands, including the (spicy) summer Heat Wave burger, which was made to pair well with the beer. We hit our goal of securing 20 attendees, including writers from CBS Los Angeles and The Orange County Register, who tasted and tweeted their way through the evening. As a result of the event, there were 33 mentions of the partnership across online and social media platforms for 1,287,003 estimated impressions. Media who couldn’t attend the event still got a chance to taste the beer: we dropped off beach coolers with a bottle of the Hula Bay IPA, branded bottle openers, koozies, beach towels and gift cards to dine at Islands to get them in the summer mindset. We also coordinated individual visits with writers, which landed more placements online in OC Weekly and Orange Coast Magazine, among others. But the coverage didn’t stop there. The team also pitched Islands and Left Coast for in-studio radio shows and beer podcasts, securing hour-long segments with The Beer Thirty Show in Los Angeles and KUCI 88.9 Beer Ambassador Show in Irvine. By the end of the summer promotion – which ran for just under three months – the team secured 56 placements across our target markets (Los Angeles, Orange County and San Diego) for more than 2 million impressions. By giving media an exclusive sneak peek, leveraging company spokespeople for broadcast interviews and delivering unique mailers that cut through email clutter, the team successfully drove awareness about the beer, which helped put it within the top three performing beers of the summer across Southern California markets. 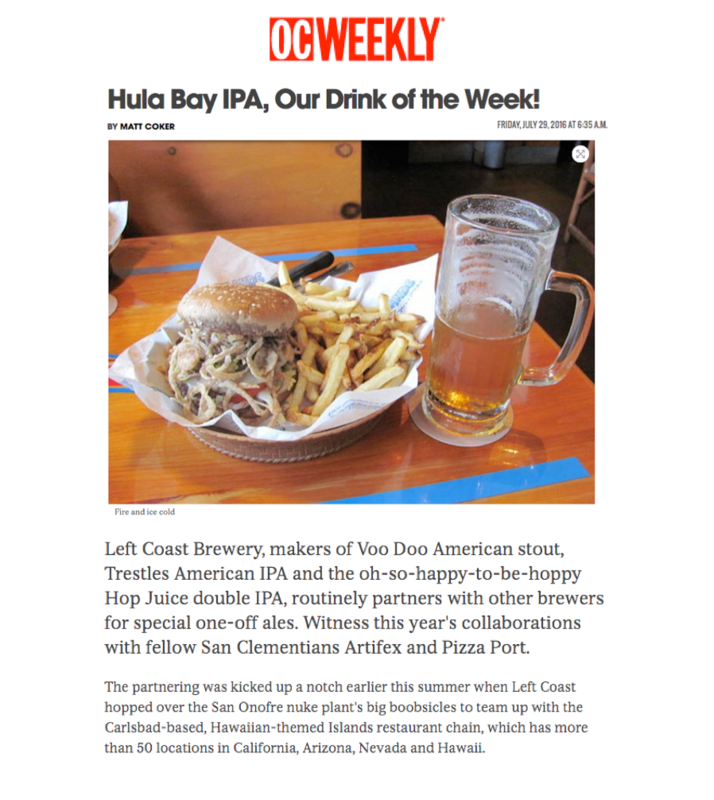 The media – and our client – were pretty stoked on the Hula Bay IPA.